Described as not as intense as his work with the Coltrane Quartet, Tyner’s second album as leader for Impulse is still noteworthy. Tyner remains one of the most influential pianists to emerge from the Sixties. His distinctive chord voicings and ease playing creatively over vamps contributed significantly to the evolution of jazz piano. 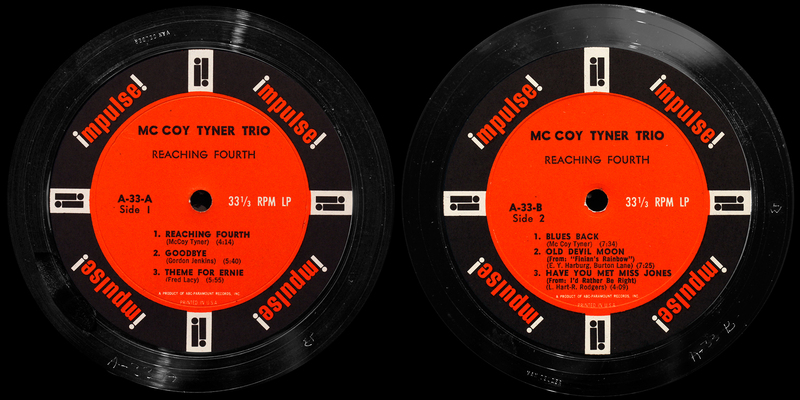 More so than in Coltrane formation, with Tyner in trio format there is an opportunity to focus on his sparkling melodic flights and interplay with the rhythm foundations, which benefit here from the ever-tasteful Mr Snap Crackle Roy Haynes. As a bonus, Impulse recordings (RVG) are generally a pleasure in their own right, whoever the artist. 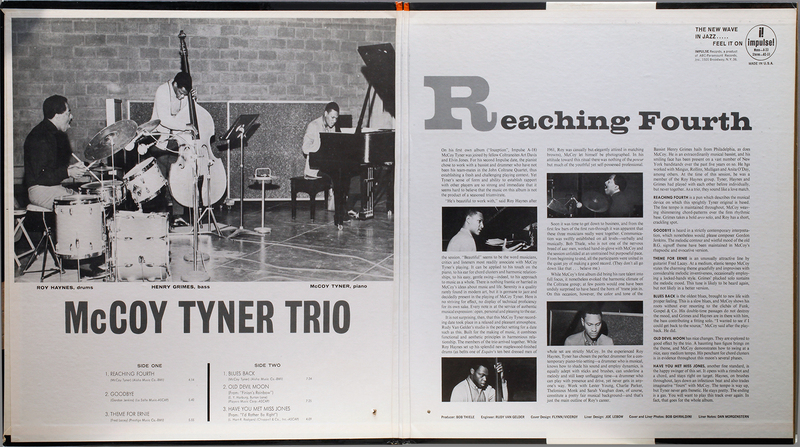 Tyner’s playing can be distinguished by a low bass left hand, in which he tends to raise his arm relatively high above the keyboard for an emphatic attack; the fact that Tyner is left-handed may contribute to this distinctively powerful style. Tyner’s unique right-hand soloing is recognizable for a detached, or staccato, quality. His melodic vocabulary is rich, ranging from raw blues to complexly superimposed pentatonic scales; his unique approach to chord voicing (most characteristically by fourths) has influenced a wide array of contemporary jazz pianists. So there you have a clue to the title, Reaching Fourths. What is a fourth? No, don’t tell me, let me guess, it’s somewhere between a third and a fif… Apparently thirds are the convention, I’m no wiser for knowing that. There is the experience of the music, which I’m fine with, then there is the technical disassembly, which I am not sure adds anything in this case. As the only surviving member of the John Coltrane Quartet, Tyner continues to play and tour today. How different might things might be if they were all still here? Perhaps not at all. Where might Coltrane’s journey of exploration reached, given an extension of forty years? Perhaps it ran its course, in its own time, avoiding reinvention in gold lame trousers, or languishing in obscurity. The benefit would be selfishly ours, to still be able to see the JC 4tet, live. Impulse catalogue number A33 was the crossover point between Am Par and ABC Paramount legend on the Impulse Orange/ Black ring label. Turning to Google for any clues as to whether this should have been Am Par or ABC I found myself directed – after Wikipedia – to my own pages at LJC. Damn Google page rank. Interestingly, of the first dozen or so auctions I looked at on Popsike, not one seller mentioned whether the label was Am Par or ABC Paramount, despite many referring to it as an “original”. Many sellers are obviously “behind the curve” on Impulse: should have checked first with LJC. Sleepy record shop in the suburbs, which nowadays has very few new arrivals in its jazz section, and whose economics depends entirely on the continued fascination with Sixties rock and pop, and the clearing out of ancient collections of vinyl lurking in the suburban attic. Sadly most Impulse you see in such a setting usually turn out to be the later black/ red ring label, or worse, the green bullseye, so I was pleased enough to find a “genuine” ABC Paramount copy. If there is one around on the Am Par label, I doubt very much there is any discernible difference when mounted on the turntable. Having read this I believed it was very enlightening. I appreciate you taking the time and energy to put this article together. I once again find myself personally spending way too much time both reading and commenting. But so what, it was still worth it! Posted at 04:19 in the morning, one of a hundred or so, so you can guess it’s another spambot network churning the same comment out by the million, this one for fraudulent gold investment. What I don’t understand is, how come they are so perceptive about this blog? 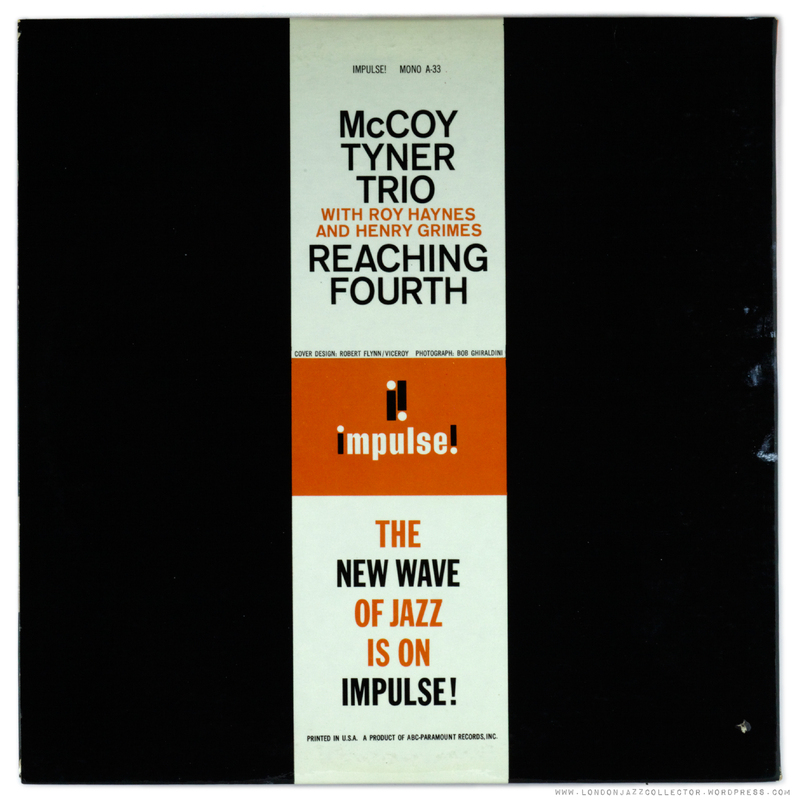 This entry was posted in Impulse, McCoy Tyner and tagged Henry Grimes, Impulse, McCoy Tyner, Roy Haynes by LondonJazzCollector. Bookmark the permalink. whats the best place to get the scores for piano for most jazz albums? Excellent writing. I also appreciate your deep research on Impulse! labelution. LJC is my go-to reference guide for label forensics. This my favorite (mine is a battered vg AM-PAR) second only to Tyner’s Inception of the same year (which was included in the in-flight entertainment last time I took a long flight–thank you Delta!). My wife just found me a nice NM red/black ’67-72 “Vangelder” copy of Reaching Fourth in a quiet basement record shop (along with an RVG/ear copy of Feddie Roach Down to Earth!). This is a great album for its showcase of Tyner’s lighter, more melodic side outside of the Coltrane quartet and with Haynes providing a bit of snap-crackle which sounds great on the RVG Impulse pressing. Excellent record of one of my favorite record labels. IMPULSE had the great courage to let jazz musicians free in their choice of decidind on how to make a record and was not afraid to have progressive artists like Coltrane, Shepp, Sanders and others recorded. Specially love their gatefold covers with glossy photographes and text. The detail of AmPar and ABC Paramount on the labels being distinctive, is new to me. So, AmPar came before the introduction of ABC Paramount? One learns everyday. What I learned some time ago is to differentiate between the shiny orange labels and the dull orange labels. 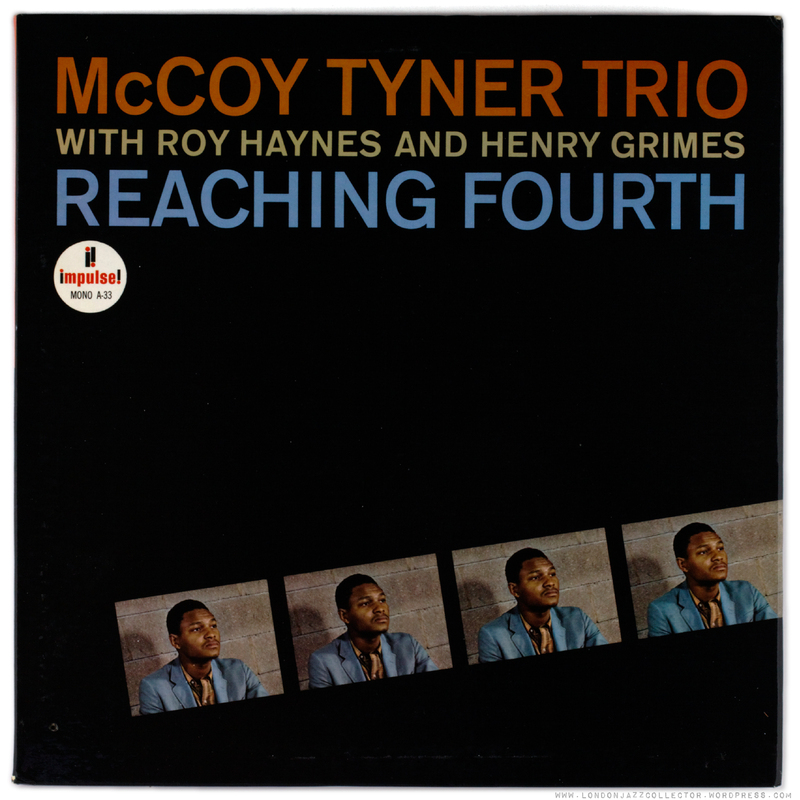 The McCoy Tyner album was my first McCoy album, and it is refreshing to hear him with Roy Haynes. Also, beautifully recorded. Congrats with your purchase. The semi-gloss and matt label finishes are only part of the story. The Am Par/ ABC Paramount distinction is (I believe) the means of distinguishing first from second pressings for the low catalogue numbers, below A33. Of course I could be wrong – that has happened before. Happy to be corrected and move our knowledge forward. I took good note of your interesting info. Many thanks LJC. Your Impulse label section is very instructive.